This post is sponsored on behalf of McCormick. I don’t know if it’s the fact that our weather has barely broken the 50 degree mark in Ohio or if I’m just behind the times, but I’m having a hard time wrapping my head around the fact that we are less than a week before Easter. My family is always last minute when it comes to planning menus and even more when it comes to decorating. I grew up using McCormick food color, water and vinegar and that will be forever and always the way we dye our eggs. The smell of the vinegar in the hot water takes me straight back to my childhood, sitting around our big kitchen table with mugs of dye, paper towels and big spoons at everyone’s seats. Such a nostalgic activity! The food color/water/vinegar method is classic and fun and when paired with fun new pattern techniques as well as this year’s Pantone colors -including the color of the year: Marsala!! – it’s still a super fresh and beautiful way to decorate your Easter eggs. It’s like two-in-one. 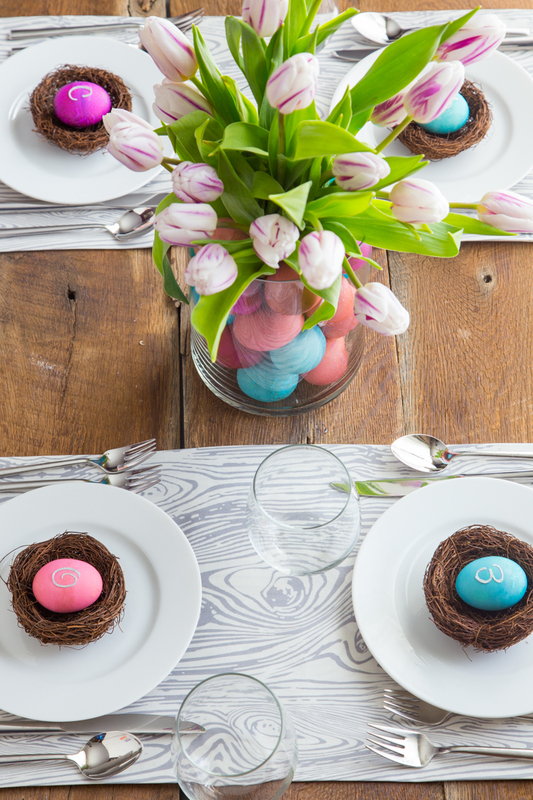 If you love dyeing Easter eggs like I do, why not put these little beauties to work decorating your table? That’s my plan. 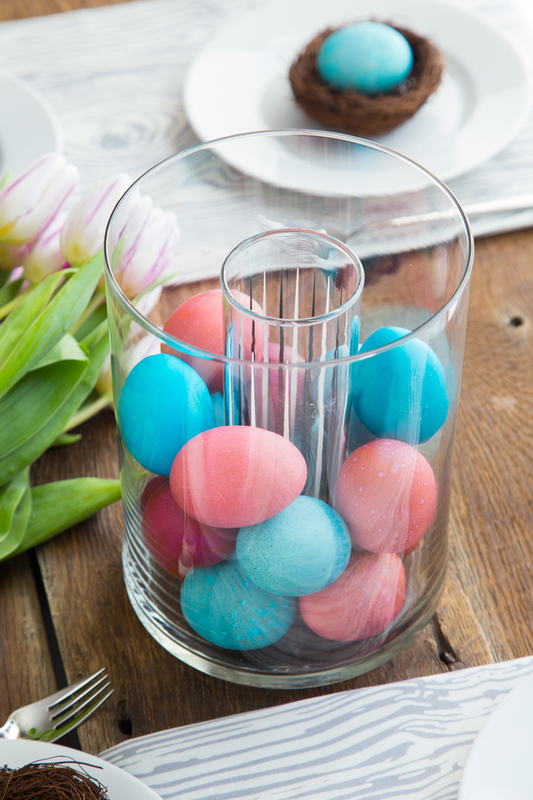 I love the idea of using these bright, bold eggs in a double walled vase to create a stunning centerpiece. 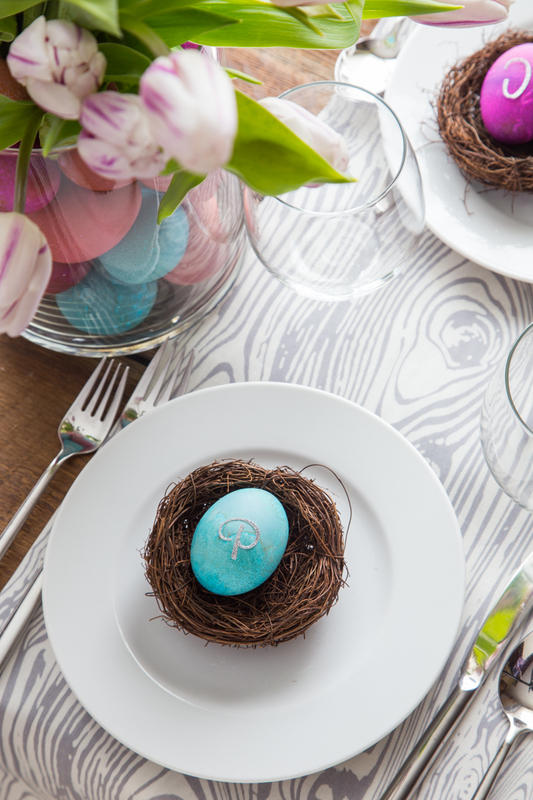 Then, put some lovely little glitter monogram sticks on an egg with a little grapevine nest for a sweet little place setting. 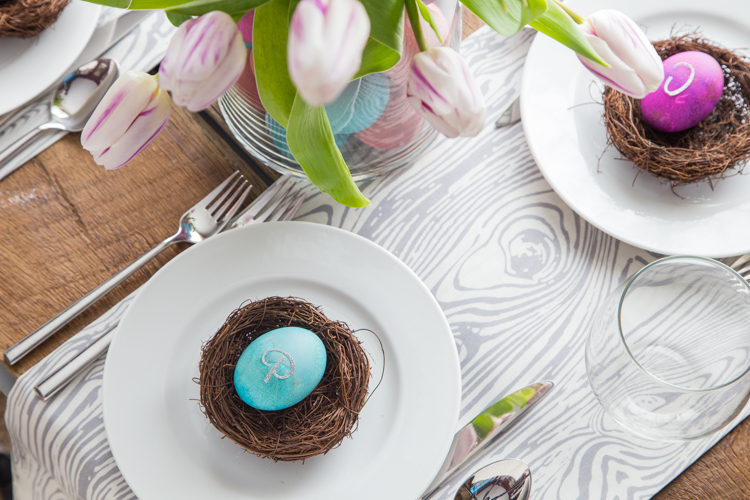 These simple ideas for an Easter egg table setting are exactly the style of decorating that I like to do. Big impact with little effort. Thanks so much, Rachel! I am so glad that I’m not the only one who gets nostalgic over the smell of vinegar, lol! I’m so glad you stopped by!